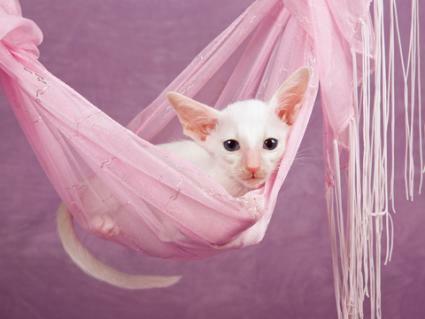 If you're looking for a unique breed, you might want to consider a white Oriental kitten. Oriental cats are recognized by the Cat Fanciers' Association (CFA). The Oriental has Siamese traits, but it comes in different color combinations, including white. However, the White Oriental is also known as a Foreign White in some circles, and it has different standards than other Orientals. The main differences seem to be between US and UK standards regarding this white cat. In the 1962, breeder and cat geneticist Pat Turner began mating Seal Point Siamese with White Domestic Shorthair cats. Her goal was to create a white Siamese with blue eyes, but without the double white genetic traits that can create deafness in cats. To this day, Foreign Whites are the only Oriental breed that cannot be bred with other Orientals. According to standards set by the Governing Council of the Cat Fancy (GCCF), only Siamese and Foreign Whites can be listed in the pedigree of this cat. The Foreign white is basically a white Siamese with blue eyes. In the United States, a White Oriental is defined by the CFA as having a white coat and either blue, green or odd-colored eyes. While White Orientals and Foreign Whites are very similar, these difference do make for some variations in the breed. In the US, breeders like Betty Purseglove in Michigan began experimenting with white Orientals. The main problem breeders ran into was how to classify a white Oriental kitten. Breeding registries in England group cats by color, while the CFA grouped cats by traits. Ultimately, it was decided that the White Orientals would be grouped in the Oriental category. In the US, it is acceptable for Orientals to be bred to other Orientals, but breeders of whites are very aware of the possibility for deafness in their cats. While breeders can make an educated guess about what color the kittens of a litter might be, the end result can vary widely. A white Oriental is a solid color. The white color should be uniform from the root of the hair to the tip and remain the same shade all over the kitten's body. The animal's overall appearance is long and svelte, with thin legs and a long tail that is proportionate to the cat's body. The nose, paw pads and eye rims are pink. However, the White Oriental is not an albino Siamese. An Oriental kitten has a tube-shaped body. The head is wedge-shaped with an elongated snout and big ears that stand up straight. Once your kitten grows into an adult, she will be a sleek, muscular feline. Orientals can have long or short hair. Most white kittens will have blue eyes, but other colors acceptable under CFA standards include green and odd-eyed (one green eye, one blue eye). Keep in mind that all kittens have blue eyes at first. The color should fully develop by the time the kitten is six weeks old. The eyes should be of medium size and almond shaped. Crossed eyes are considered undesirable. Standards in the United Kingdom only allow for blue eyes in the breed. If you've decided to adopt an Oriental kitten into your home, finding a reputable breeder is the next step. This breed was recognized by the CFA for competition in 1977. Since that time, the breed has continued to grow in popularity. Unfortunately, this also means that there are some unscrupulous breeders just trying to make a buck. However, the best breeders are concerned with maintaining breed integrity for future generations. You will also need to decide whether you want a breeder that goes by CFA or GCCF standards. The easiest way to find a reputable breeder is by asking others who own Orientals where they purchased their cat. Once you locate a few breeders, phone them and ask about the pedigree of the kittens, if the kittens are registered with the CFA or the GCCF, how many litters a year the mother cat births and if they have white kittens available. If at all possible, it is also a good idea to visit the breeder. Most breeders treat their cats like part of their family, and they only separate them to protect newborn kittens or for breeding purposes. This ensures you will likely get a well-socialized kitten. Orientals have a tendency for allergies and respiratory issues, as well as genetic heart disease. You'll want to ask the breeder if any of this runs in the kitten's family. Should you choose to take on a white Oriental kitten, you will be taking on a kitten with a big personality. Orientals are known to bond closely with their human companions. A kitten will likely follow you from room to room while meowing and demanding your attention. These kittens like to be in the center of any family activities. If you are working on the computer, your kitten will likely plop down in the middle of your keyboard or perch on your shoulder while you try to type. Orientals are highly intelligent and can be trained easily and taught to "fetch". Since Orientals do become attached to their owners, it is best to make sure you can commit to keeping the cat for its entire lifespan. With a little love and attention, your new kitten will become a devoted and loyal lifetime companion.